BAYSVILLE, ON – Lake of Bays Brewing has announced the upcoming release of a limited edition beer that will mark the centenary of the death of one of Canada’s greatest artists. The West Wind Black IPA pays tribute to painter Tom Thomson who drowned in 1917 at the young age of 39, but left behind a legacy that influenced many later artists, including the legendary Group of Seven. At 7% abv and 90 IBUs, this beer is set to satisfy big IPA lovers and dark ale drinkers alike. You’ll catch a hop-forward aroma with a scent of chocolate and raisin. The toasted wheat and chocolate malts develop The West Wind’s dark colour and create a deep malt character that softens the hoppy brew. 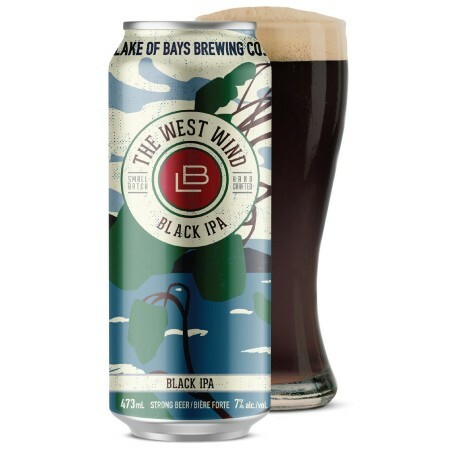 The West Wind Black IPA will be released in mid-September, and will be available in 473 ml cans at retailers throughout Ontario. Partial proceeds will be donated to the Art Gallery of Ontario (AGO), which owns the painting and allowed Lake of Bays to reproduce it on the packaging and promotional material for the beer. Details of launch events for the beer at the AGO in Toronto and a location to be announced in Huntsville are expected to be confirmed soon.